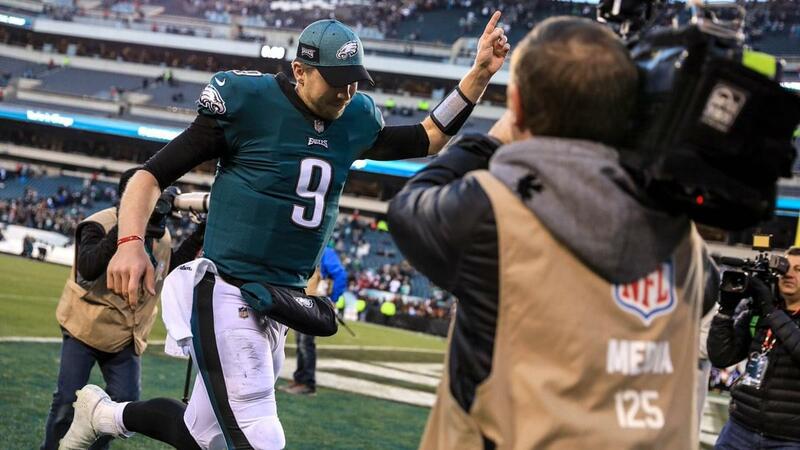 I believe the Jaguars will target Philadelphia quarterback Nick Foles once he’s a free agent. The Jaguars won’t trade for him and I don’t think they’ll have to make a deal with the Eagles. So, what would the Foles Plan look like? There are a few steps involved in acquiring Foles. Let’s go through that and then project what the Jaguars could do with their draft picks. The Jaguars are currently a projected $7.5 million over the predicted salary cap for next season. Here’s the purge needed. Release quarterback Blake Bortles with the post June 1 designation to avoid a $16.5 million dead money charge. This saves $9.5 million, spreading out the dead money charge to $11 million this season and $5 million in 2020. The extra $5 million pays for this year’s draft class. Release defensive tackle Malik Jackson, right tackle Jermey Parnell, running back Carlos Hyde and tight end Austin Seferian-Jenkins. This saves $32 million in cap space. So, we’ve created over $34 million in cap space to pursue Foles. That was easy and painless. The Jaguars will have money to sign some mid-level free agents, but the bulk of the build around Foles will come through the draft. Signing Foles would take the Jaguars out of the first-round quarterback market. Here’s the first thing Jaguars personnel chief Tom Coughlin and general manager Dave Caldwell should do: Make a deal with Green Bay. The Jaguars should reach a pre-draft deal with the Packers, a trade that can’t be announced for strategic purposes until the Jaguars are on the clock with the seventh pick. This is a defensive draft and the Jaguars should take advantage of that since they need offense. The Jaguars should move back five spots to Green Bay’s 12th spot. Green Bay, armed with 10 picks, could be motivated to move up at a fair price. The Packers need a defensive star and the four teams ahead of them could easily all pick defensive players. The Packers would move up ahead of NFC North rival Detroit who has the eighth pick. A fair return would be Green Bay’s third rounder (No. 75) and fifth-round selection (No. 139). The Packers would still have New Orleans’ first-round pick (No. 30), along with their own second, two fourths and eight overall picks. Now the Jaguars have three third-round picks, as the Green Bay selection joins the pick acquired from the Los Angeles Rams in the Dante Fowler trade. So, what might that draft look like? Why: All-around tight ends like Hockenson simply don’t come around much anymore. Hockenson (6-5, 250) is a great receiver, but an amazing blocker. He won the Mackey Award as the nation’s best tight end this past season after catching 49 passes for 760 yards with six touchdowns as a redshirt sophomore. Hockenson should be on the board. Over the last four years, the first tight end selected has come at the 25th, 19th, 35th and 55th pick. Coughlin has been searching for an all-around tight end that doesn’t tip off the defense to what the offense is doing when he’s on the field. Hockenson ends that search, giving Foles a playmaker at tight end while boosting the run blocking. Why: Harry (6-4, 213) posted back-to-back 1,000-yard receiving seasons with 22 touchdowns before leaving school early for the draft. He shows brilliant body control, physicality and vision as a runner after the catch. Arizona State coach Herm Edwards has lauded Harry’s work ethic. The Jaguars add Harry to a lackluster receiving corps featuring Dede Westbrook, Marqise Lee, DJ Chark and Keelan Cole. Check out Harry’s amazing catch against Southern California on YouTube. I’ll let you know what I think the Jaguars should do in rounds three through five in tomorrow’s column.